With this article, we want to share with you how long is the tradition of the wine and how this amazing beverage was important during the centuries. 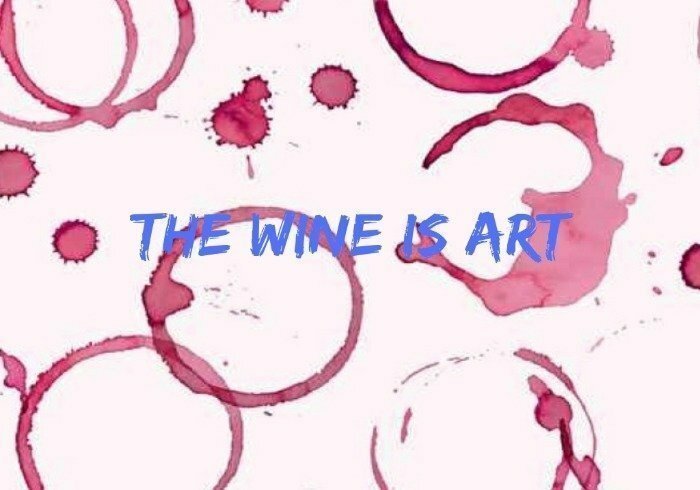 Here a brief online Art Gallery to show you that Wine is really art!! 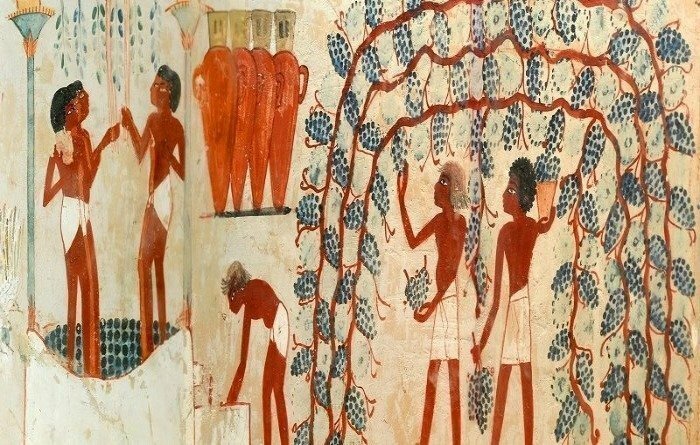 The value of wine, in the Egyptian civilization, was immense in terms of culture and material. This beverage was diffuse between the population and it was an important food integration. Wine, anyway, was also used for religious things like during the mummification process, thanks to its alcohol and tannic components that help to reduce putrefactive phenomena. In this Painting Andrea Mantegna represent Silenus during a Bacchanal, the wine is almost described like an object of perdition. The Silenus is a folkloric man of the forest with the ears of a horse and sometimes also the tail and legs of a horse. The later Sileni were drunken followers of Dionysus, usually bald and fat with thick lips and squat noses, and having the legs of a human. Later still, the plural “sileni” went out of use and the only references were to one individual named Silenus, the teacher and faithful companion of the wine-god Dionysus. A notorious consumer of wine, he was usually drunk and had to be supported by satyrs or carried by a donkey. Silenus was described as the oldest, wisest and most drunken of the followers of Dionysus, and was said in Orphic hymns to be the young god’s tutor. A bacchanal is instead a crazy party with drunken revelry, ecstatic sexual experimentation, and wild music. 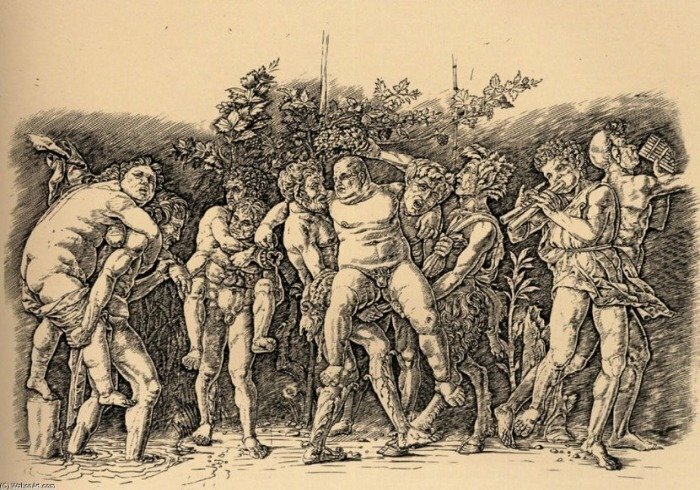 Bacchus was the Roman god of wine, which lost the chains of social restraints; and so, the name of Bacchantes’ hedonistic, pleasure-filled gatherings was named bacchanals. This biblical story narrates how Cam, Noah’ son, saw his dad drunk for the wine, that was lying undressed under a hut, so he decided to warn his brothers. Sam and Iafet, came to cover him with a mantle. 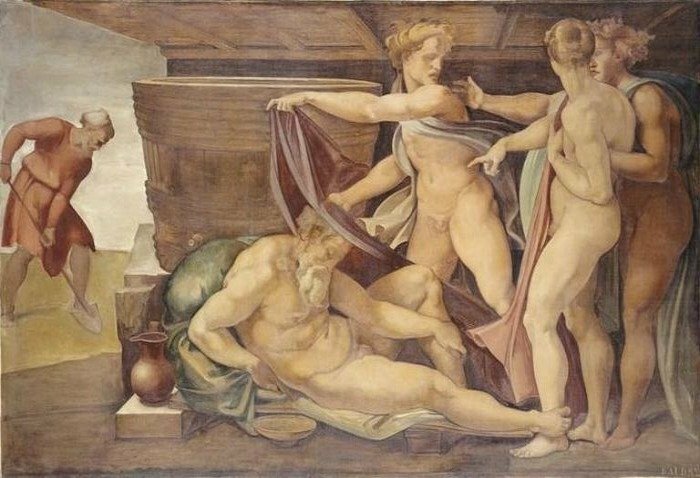 Michelangelo set this scene in a wooden hut, with the body of the patriarch drunk and dozed. Near him, we can see a bowl and a pitcher. In the center, under the hut, we can see a big wine vat. 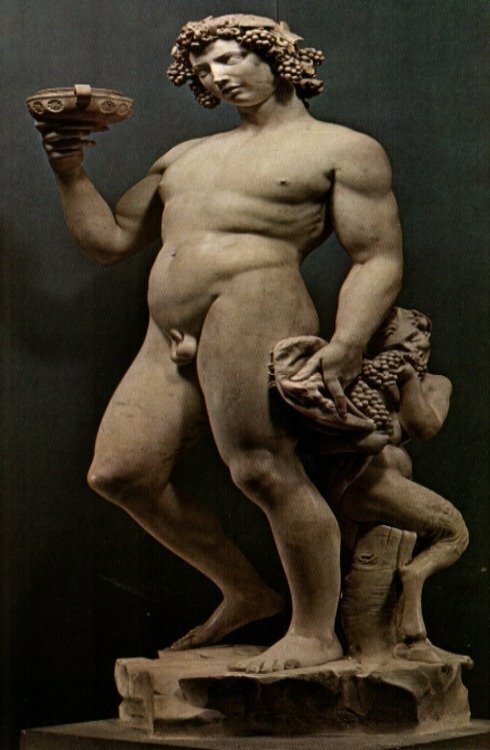 Bacchus (1496–1497) is a marble sculpture by the Italian High Renaissance sculptor, painter, architect, and poet Michelangelo. The statue is somewhat over life-size and depicts Bacchus, the Greek god of wine, in a reeling pose suggestive of drunkenness. Along with the Pietà, the Bacchus is one of only two surviving sculptures from the artist’s first period in Rome. Bacchus is depicted with rolling eyes, his staggering body almost teetering off the rocky outcrop on which he stands. Sitting behind him is a faun, who eats the bunch of grapes slipping out of Bacchus’s left hand. Bacchus wears a wreath of ivy leaves, as that plant was sacred to the god. (They are not, as is often supposed, vine leaves). In his right hand, he holds a goblet of wine and in his left the skin of a tiger, an animal associated with the god “for its love of the grape”. 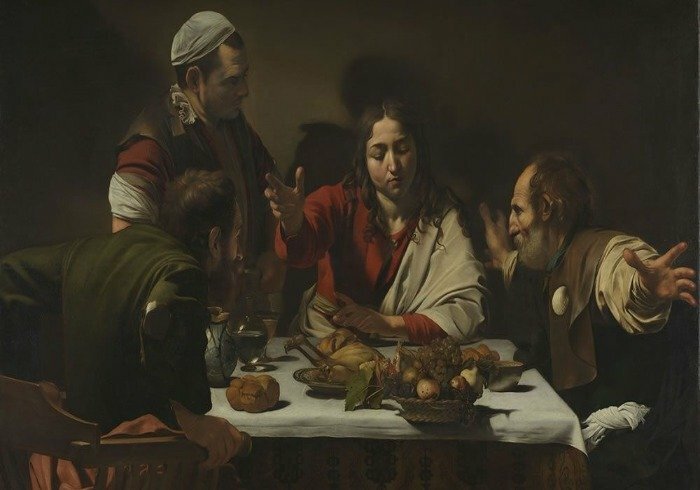 The Supper at Emmaus is a painting by the Italian Baroque master Caravaggio, executed in 1601, and now in the National Gallery in London. Originally this painting was commissioned and paid for by Ciriaco Mattei, brother of cardinal Girolamo Mattei. The painting depicts the moment when the resurrected but incognito Jesus, reveals himself to two of his disciples (presumed to be Luke and Cleopas) in the town of Emmaus, only to soon vanish from their sight. Cleopas wears the scallop shell of a pilgrim. The other apostle wears torn clothes. Cleopas gesticulates in a prospectively-challenging extension of arms in and out of the frame of reference. The standing groom, forehead smooth and face in darkness, appears oblivious to the event. The painting is unusual for the life-sized figures, the dark and blank background. The table lays out a still-life meal and you can easily see a pitcher of wine (symbol of the blood of Christ). Like the world these apostles knew, the basket of food teeters perilously over the edge. The scene likely represents some type of courtship, but the roles being played by the two figures are not clear. The woman has just drained the glass of wine and the man seems impatient to pour her more, almost as if he is trying to get her drunk. A musical instrument, the cittern lies on the chair with musical notebooks. But the figure of Temperance is depicted in the stained glass window, adding tension in the scene. 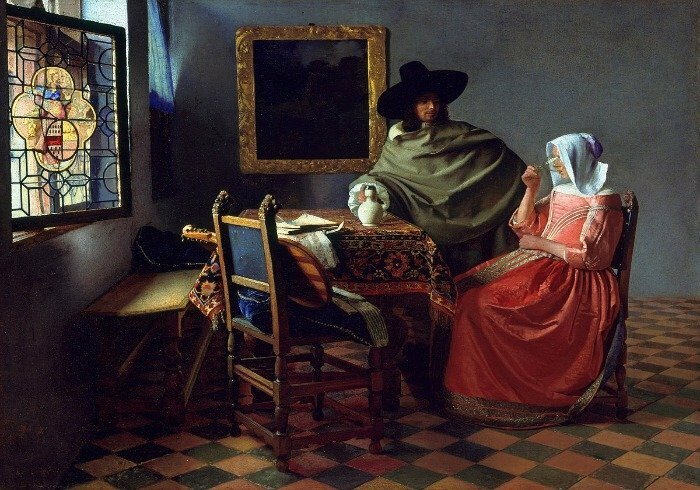 Music and Wine were important elements of the “Loving Conversations”, a pictorial genre pretty famous in Holland during that period. The wine spillers express a lively and mature realism, beyond the theatrical representations evident in other paintings, in which also the wine as everyday and simple beverages are present. 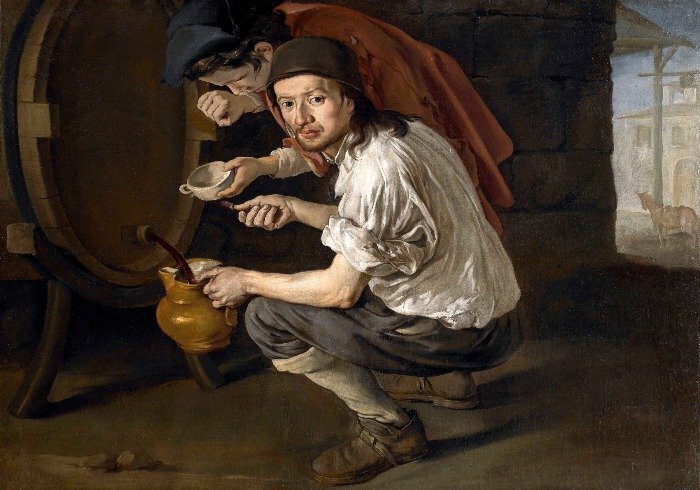 The composition is presented as a snapshot: the young tapper or spiller bent on his knees in front of the barrel, seems to have suddenly turned around feeling the presence of someone. The painting is rich of details which provide clues to social class and milieu. The woman at the bar is a real person, known as Suzon, who worked at the Folies-Bergère in the early 1880s. For his painting, Suzon posed in his studio. 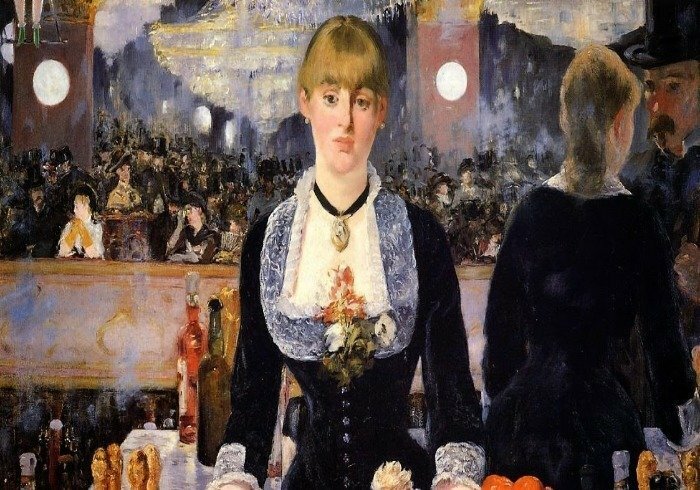 By including a dish of oranges in the foreground, Manet identifies the barmaid as a prostitute, according to Larry L. Ligo, who says that Manet habitually associated oranges with prostitution in his paintings. T.J. Clark says that the barmaid is “intended to represent one of the prostitutes for which the Folies-Bergère was well-known”, who is represented “as both a salesperson and a commodity—something to be purchased along with a drink.” Other notable details include the pair of green feet in the upper left-hand corner, which belong to a trapeze artist who is performing above the restaurant’s patrons. The beer bottles depicted are easily identified by the red triangle on the label as Bass Pale Ale, and the conspicuous presence of this English brand instead of German beer has been interpreted as documentation of anti-German sentiment in France in the decade after the Franco-Prussian War. The Day After is a squalor and desolation scene, represent admirably the defeat that love can cause. 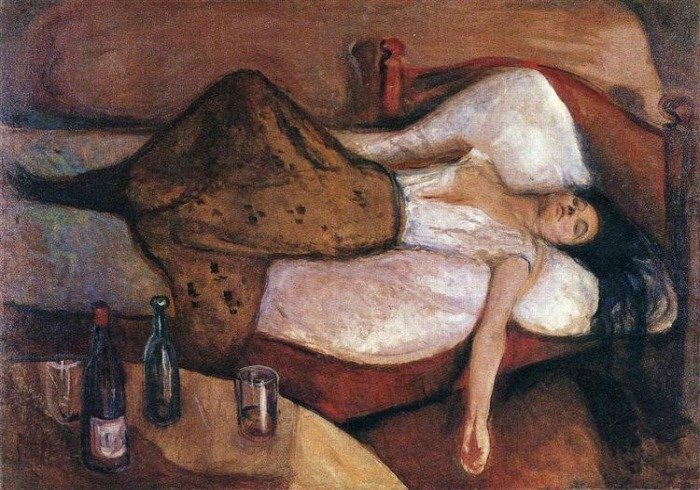 A woman lay on the bed after a night or day where she drunk wine to not feel hurt anymore. It pointedly represents misery and desperation. In the foreground, on the meager tablecloth, there are remains of bread and wine. Behind, the seated couple joined in melancholy but at the same time distanced, despite the tender embrace from the man, are each immersed in their own desolation. 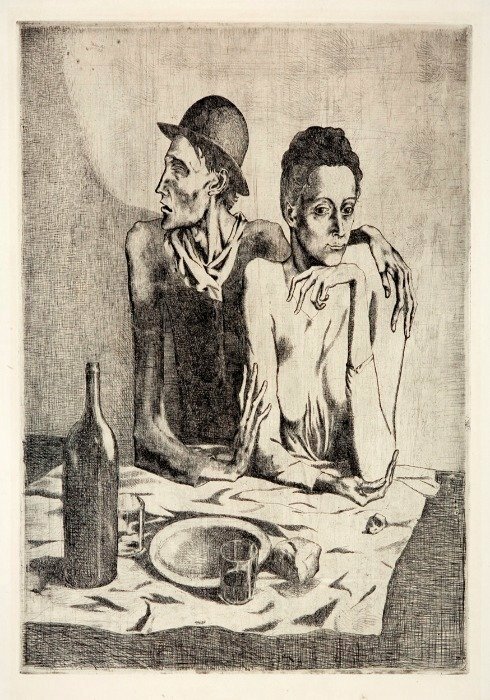 The artist’s concentration on humanity and, above all, the poor and other socially outcasted characters is revealed in this etching – hungry men and women with passive apathetic expressions, characters who are humbled by their own weight, often immersed in the characteristic empty scenes from this early Blue Period. The biggest single discovery seems to have been that a modern painting need have no perspective. It doesn’t have to be a window or a box containing things from ‘the real world’ in a ‘realistic’ relationship. There are roughly two steps in his development: In the earlier Surreal works Miró explores how objects from ‘the real world’ can be portrayed out of any context or perspective – very much the kind of random combinations which Surrealism favored (though always in French, obviously). 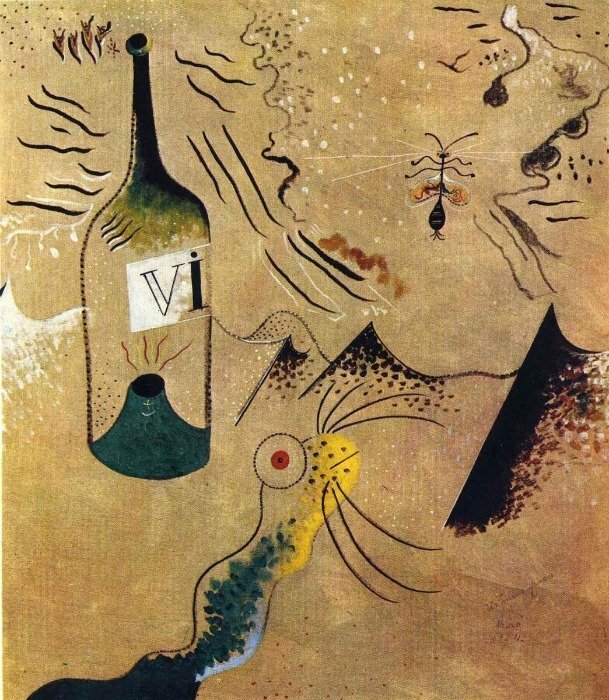 The wine bottle and fly are still identifiable in this transitional work.